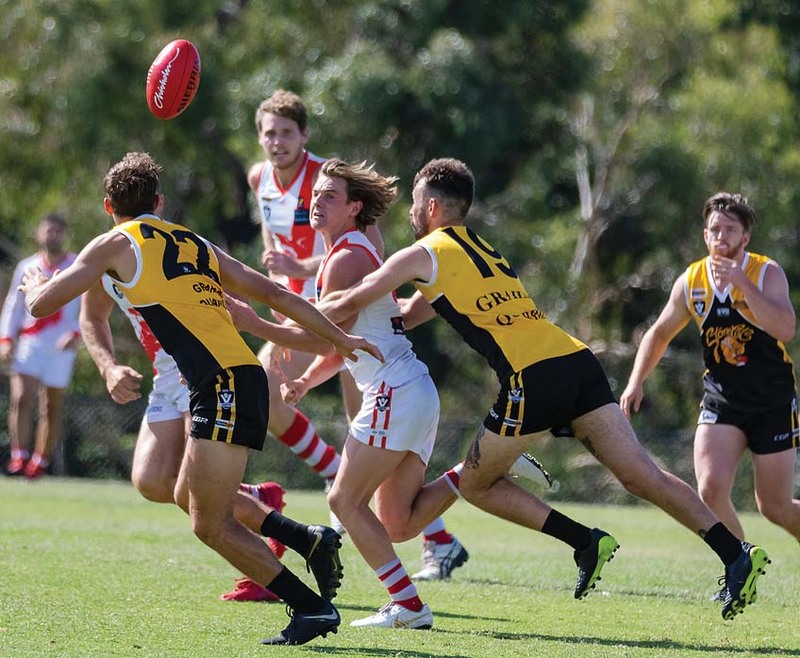 SORRENTO have taken their first steps towards retribution for last year’s devastating grand final loss, as they defeated the Stonecats to kick start their 2019 campaign. Frankston YCW looked electrifying in the first quarter, as they shocked Sorrento with a seven goals to one start. Staring at a 40 point deficit in the face, the Sharks had a mountain to climb to get back into the contest. The Sharks chipped away and by three quarter time they held an 11 point lead. The clash between the two MPNFL heavyweights was a tough one, but in the end Sorrento ran out winners 13.18 (96) to 17.7 (109). Leigh Poholke kicked four majors while Luke Tapscott chipped in with three. At Emil Madsen Reserve, Pines got their premiership defence started in impressive fashion, as they fought off Mt Eliza. The Redlegs were the more impressive side early and went into quarter time with the lead, but the Pythons quickly bit back. Mt Eliza put up a tough fight, and were three points up heading into the final term. In the end Pines were just too good, as they claimed victory 10/8 (68) to 12.12 (84). Guy Hendry scored four goals for the winning outfit. Dromana’s first hit out in the first division went brilliantly, as they claimed all four points against Rosebud away from home. Rosebud were on top early with a first quarter where they had eight scoring shots to three. Rosebud could only convert one goal from that though, and went in level at the first break. Dromana made Rosebud pay for their inaccuracy, and in the final term ran away with it to secure their first top flight win 5.11 (41) to 11.8 (74). At Greg Beck Oval, Jarrad Grant ran rampant to help his Frankston Bombers side claim a narrow victory over Bonbeach. Grant, a former AFL level player with the Western Bulldogs and Gold Coast, showed the form that made him a top level player with a best on ground performance. The contest was tight all day long, with less than two goals separating the sides at every break. Heading into the final term down by 10 points, the Bombers kept their chins up and ended up 15.11 (101) to 15.4 (94) winners. Inaccuracy plagued Edithvale-Aspendale in their matchup against Mornington, but they still did enough to secure the win. Edi-Asp led the Bulldogs all day, and eventually secured the win in front of their home crowd 12.25 (97) to 7.10 (52).